The future of business software. Available now. 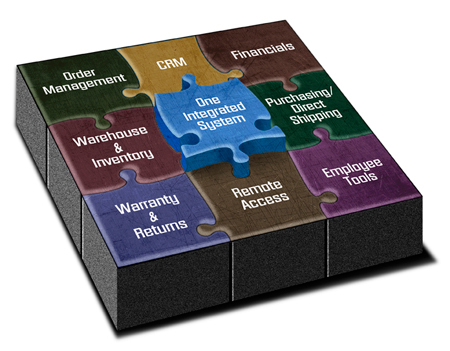 Solentris is a comprehensive suite of Accounting and business software including modules that support Order Management, Purchasing/Direct Shipping, Financials, Inventory, Warranty & Returns, Remote Access and more. Solentris is easy to implement because it operates using standard Internet browsers for client access and is hosted in our secured data centers. This means that your business can get started with little or no local hardware or software investment. What makes our Enterprise solutions so popular? Real-time information presented clearly and logically, powered by the world's only Virtual Manager technology. No servers or software to install. Solentris is hosted in a secured data center and accessible through modern web browsers. Access your system from anywhere! Any computer or mobile device works with Solentris. Solentris grows with your business. Take advantage of powerful features or customize Solentris to meet your unique requirements. Enhance your organization's customer service. Powerful reporting and alerts means you can manage your business even more efficiently.